The Cobblers have signed MK Dons striker Alex Revell on a two-year contract. 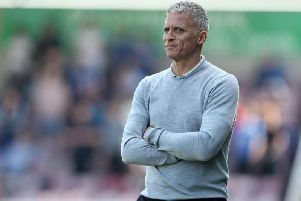 The 32-year-old frontman rejected offers from a number of clubs to sign on at Sixfields, and Town manager Rob Page is delighted, saying his acquisition is ‘a statement’ by the club as they prepare for life in Sky Bet League One. “Alex is a fantastic signing for us and I am delighted to welcome him to the club,” said Page. “He is a striker of proven quality and experience in League One and the Championship and his knowledge of that level will be a massive help to the squad. “This is a big signing for the club, a statement from us and we have had to be patient but we have beaten off a lot of competition to secure Alex’s signature and I am sure he will be a big asset to us. Revell is a 6ft 3in tall target man, and has a wealth of experience of playing at league one and championship level. His previous clubs include Brighton & Hove Albion, Southend United, Leyton Orient, Rotherham United, Cardiff City, Wigan Athletic and MK Dons. Revell has made 371 starts and 123 substitute appearances in his senior career, which started at his home town Cambridge United in 2000, and has scored 94 goals. The striker had to drop out of league football when he was released by Cambridge in 2004, and went to Braintree to play in non-League. His form for Braintree, where he scored 35 goals over two seasons, attracted the attention of Brighton, and they signed him in the summer of 2006 to give the player a route back into League football, and he has taken his second chance with both hands. Last year Revell began the 2015/16 season in the championship with Cardiff City, before moving on loan to Wigan Athletic in league one and then signing for MK Dons in February, scoring four times in 17 appearances while at stadiummk.